Check my Introduction to Jasper Reports and Sub-report with jasper Report posts. In this post we going to use 1st option. 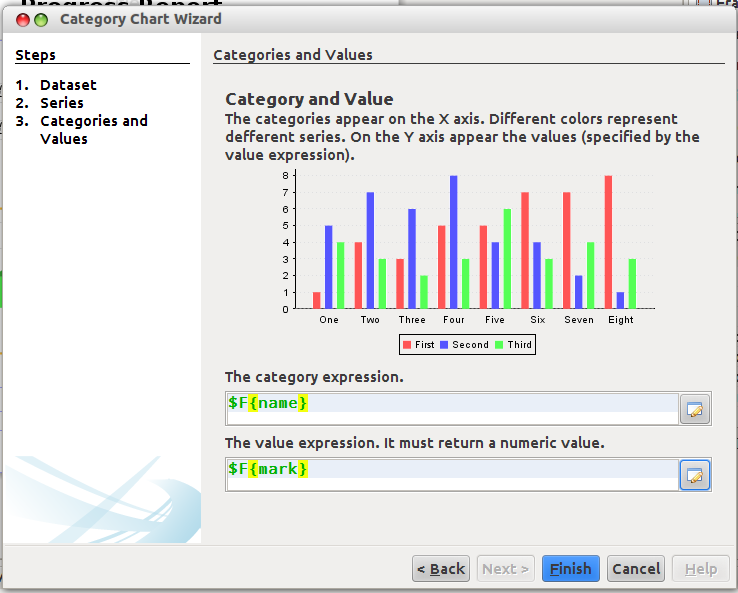 In Jasper Report use JFreeChart Components to make charts. In my next post we will see the 2nd way to generate the charts in reports. 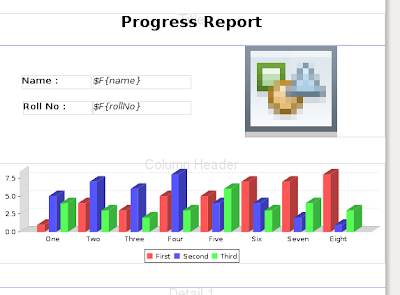 I ll create one sample application (Progress Report) to demonstrate the Integrate the charts in reports. I have Student Bean contain name, roll No, image and List of Semester paper beans. In Semester paper bean contain name of the paper and mark(score). we can use either iReport Standalone version or Jasper report Net-beans plugins to create the jasper Reports. 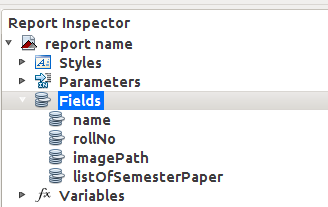 Create empty reports and create the fields and these fields are match with Student bean property variables. 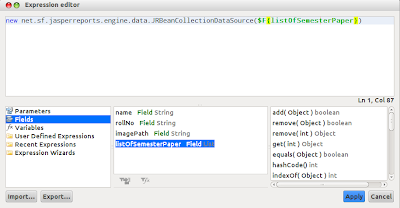 here name,rollNo and imagePath are String. so no need to change the data type of field. but listOfSemesterPaper is List. so change the data type of the field to List. here name and rollNo fields are dragged into report canvas, then drag the Image component and change the expression of Image component to imagePath field. Now we ready for bring the Chart component. 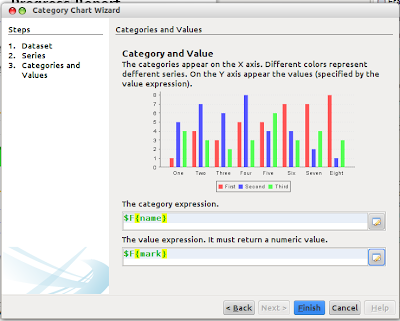 But chart data are stored in listOfSemesterPaper field. Its List. So we can't use directly. so we going to create sub data set from main data set. so create sub dataset named "ChartDataset". and In sub data set create another 2 fields match with SemesterPaper bean. here name is String and mark is double. and final step is we need to explicitly mention how main data set is divied into sub data set. In sub data set "ChartDataset" is take value of listOfSemesterPaper field. this fields is List. 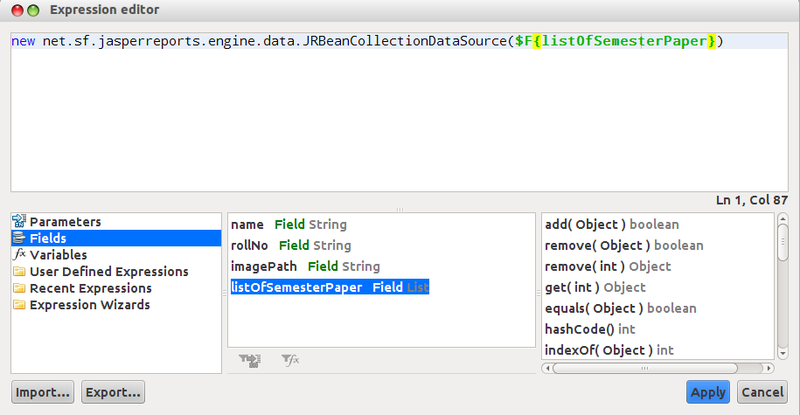 so we need to wrap into JRBeanCollectionDataSource. that's it. now compile the report and generate the .jasper format. then integrate into Netbeans project.